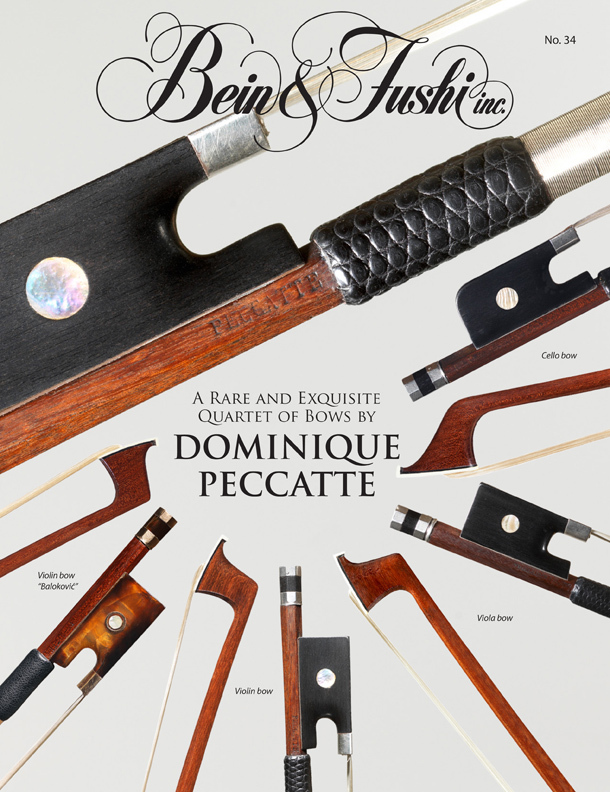 We are honored to offer an extraordinary and rare quartet of all-original bows by the legendary Dominique Peccatte. ould have bows with magnificent playing qualities and strength that are exceptionally well-matched in their capabilities. One of the greatest of bow makers, Peccatte was born in Mirecourt, which was a major center of French bow-making. He was chosen by François Vuillaume to go to Paris. While there, he worked in the shop of his brother, who was the illustrious dealer and maker J. B. Vuillaume. Peccatte trained under master bowmaker Jean Pierre Marie Persoit. Peccatte left Vuillaume in 1838 to take over the shop of François Lupot after his death. During the course of his long career, Peccatte combined his gift for bow making with a savvy business acumen that brought him wide recognition and success. These bows are among the very best violin, viola, and cello bows by the master that we have seen. This quartet would be a spectacular and unique acquisition. And it would be an outstanding investment for any aspiring or accomplished string quartet, distinguished collector, or gifted artists. Peccatte’s bows were among the most coveted by professionals during the maker’s lifetime and are highly sought after today: a testament to his enduring genius.